What Makes a Piece of Craft Art Truly Extraordinary? Find out what Robyn Kennedy, Chief of the Renwick Gallery, Chris Shea, metal artist and blacksmith, Michael Janis, Co-Director of the Washington Glass School, and Binnie Fry, independent curator and art consultant. Women Opening Doors for Women (WODW) was founded 20 years ago around a kitchen table, when women came together to help each other achieve professional success. Join their Arts and Culture Network as they discuss how to land a job in the art sector. Fields to be discussed include interior design, art teaching, and graphic design. Speakers will share their own personal experiences, discuss challenges that they have faced, and offer tips on how to be successful in their chosen field. Speakers: Mukti Desai, Senior Graphic Designer at AAUW (American Association of University Women) and owner of Nectar Design Studio; Susan Dorsey, Head Designer at Ethan Allen; Erin Kelly, Art Teacher and Advisor with Youth Engagement Academy, DC Public Schools. Location: Capitol Hill (at The Stewart Mott House). Location is accessible via the Capitol Hill Metro and 36 and 39 buslines. Planners: WIN Arts and Culture Network Chairs: Caitlin Jennings, Alicia Cohen, and Kate Hewlings. Reston artist Christine Lashley won the Top Prize at the Riverbend Park Annual Paintout Competition last week. 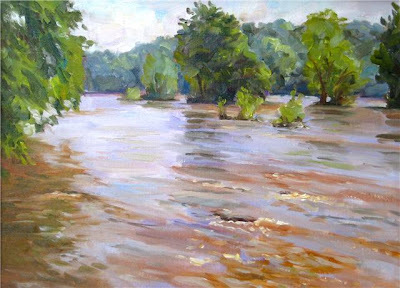 At Riverbend Park's 4th annual 'plein-air' juried painting competition this past Saturday, Restonian Christine Lashley won the Best in Show prize for her oil painting "High Water." Artists from around the area competed for cash awards thanks to the generosity of Jan and Dan Laytham of Long and Foster Realtors, Great Falls, VA. Paintings produced for the paintout must have been started and completed in their entirety on the day of the paintout between the hours of 5:30AM and 12:30PM. The freshly created artwork was judged by Armand Cabrera. Mr. Cabrera mentioned that he loved the Riverbend paintout as it was "the only 'true plein-air' competition on the East Coast" because there was no time for artist's to edit the morning's painting later, unlike other paint competitions that can last several days. All the artwork created will be on display at the Visitor's Center from June 9 - June 20, 2009. A portion of proceeds from the art competition benefit the Friends of Riverbend Park (a non-profit group supporting the park). The park's staff and Artist in Residence, Jack Warden (the show's coordinator) hope that the competition will raise awareness about the park and all the beauty it has to offer. Christine Lashley enjoys painting on-location in the ‘plein air’ style for a direct response to a scene. Lashley says "I interpret what I see through my passion for color. If I can capture the light in the landscape it will set the mood and convey a strong impression of the scene; much more that a 100% accurate representation could." I'll be participating in a discussion panel this coming June 20th at the 2009 International Arts Journalism Institute in the Visual Arts, a program sponsored by the National Endowment for the Arts and the U.S. State Department and hosted by American University. I plan to visit AOM this Saturday, stand by for news! Tate’s sculptures ask you to surrender your guarded self and feel the range of emotions that they provoke. His newest works - larger and more complex - speak to universal issues, a shift from earlier work that was profoundly personal. Read Daily Art Muse here. Artomatic isn’t about finding the diamond in the rough: Think cubic zirconia instead. Each spring brings the polarizing art-for-the-masses show, and this year's event features more than 1,000 visual artists (and another 600 performers). With nine floors of art displayed science-fair style in an unoccupied office building near the Nationals’ stadium, the offerings can be overwhelming. But for the serious art aficionado, how many of those 1,000 artists are worth seeing? We’ve capped that number at a strict 0.005 percent. Read Maura Judkis on Decider DC here. 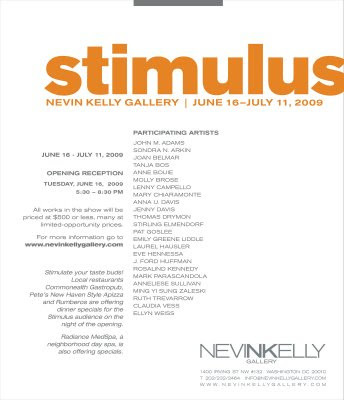 In recognition of the challenging economic times, DC's Nevin Kelly Gallery, located at 1400 Irving Street, NW, #132, will showcase “Stimulus,” a group exhibition of works by more than twenty DC area artists at limited-opportunity prices. The gallery has selected, a Tuesday evening (June 16), typically a slow night for galleries and other businesses, for the opening reception. Joining in the celebration, several local restaurants and other business will offer their own stimulus packages on opening night. Show runs June 16 through July 11, 2009; Opening Reception, Tuesday, June 16 from 5:30 - 8:30 pm. Participating artists include: JOHN M. ADAMS, SONDRA N. ARKIN, JOAN BELMAR, TANJA BOS, ANNE BOUIE, MOLLY BROSE, MARY CHIARAMONTE, ANNA U. DAVIS, JENNY DAVIS, THOMAS DRYMON, STIRLING ELMENDORF, PAT GOSLEE, EMILY GREENE LIDDLE, LAUREL HAUSLER, J. FORD HUFFMAN, ROSALIND KENNEDY, MARK PARASCANDOLA, ANNELIESE SULLIVAN, MING YI SUNG ZALESKI, RUTH TREVARROW, CLAUDIA VESS, ELLYN WEISS and yours truly. Local restaurants Commonwealth Gastropub, Pete's New Haven Style Pizza and Rumberos are offering dinner specials for the Stimulus audience on the night of the opening. Radiance MedSpa, a neighborhood day spa, is also offering specials, and other local businesses are expected to sign up. Interested individuals can check the gallery's website for more information on participating businesses and their special offers. The gallery is located half-a-block from the Columbia Heights Metro station on the Green Line, and all participating businesses are within a block or two of the Metro station.